Despite the explosion in popularity of mixed martial arts in the last 4 years, there have been few attempts thus far to conduct any serious analytical research on the sport. Given this dearth of in-depth analysis, the mere act of publishing Fighting for Acceptance: Mixed Martial Artists and Violence in American Society constitutes an important step in the sports history. Authors David T. Mayeda and David E. Ching have both the blessing and curse of being among the first writers out of the gate with an attempt at investigating some of the issues concerning this controversial sport, and the result is a solid but ultimately flawed effort that will hopefully facilitate further investigations. While this work grants readers access to the thoughts of many key figures in the sport, it suffers from a lack of depth and focus caused largely by the scattershot approach to the subject and a pseudo-scientific narrative conceit. The title of this book would lead one to believe that its subject is the development of MMA from underground spectacle to mainstream phenomenon and all of the growing pains associated with its explosion in popularity. By the midpoint of the book you realize that it is actually a collection of individual essays tied together with a somewhat tenuous narrative thread. Authors Mayeda and Ching take turns addressing topics as broad and varied as the sport’s history, safety record, fighter psychology, gender issues, and the responsibility of participants to preach non-violence to society at large. Any one of these topics, if investigated singly and thoroughly, could have filled the 250 pages of this book and been the better for it. By attempting to tackle all of these topics at once the authors have short-changed their ability to provide substantial arguments on any one subject. The chapter on MMA’s safety record perhaps comes closest to a full-bodied analysis as the authors provide actual research data on injury statistics in MMA compared to other sports. Other chapters, such as those dealing with the question of MMA’s effects on street violence, suffer drastically from a lack of statistical support. Is there a basis for concern that MMA will contribute to an increase in violence on the street? Is there much insight to be gained from a handful of interviews on this subject versus actual data to give the question the proper context? It is unfortunate that authors Mayeda and Ching pursue this topic without the proper tools of analysis while giving short shrift to very fertile topics, such as gender issues in the sport. Given that the authors are both academics with graduate degrees, it is perhaps understandable that their work here is presented with many of the trappings of a sociological text. Chapter 3, titled “Methodological Notes and the Interviewees,” consists of 24 pages describing their methods in great detail, followed by a bio of each of the 40+ interview subjects. While the intent of this chapter is to give full disclosure of the author’s methods, there is no reason to spend 6 pages essentially saying “we sat down and interviewed people.” This level of detail regarding methodology would be more appropriate if the authors were conducting statistical or laboratory-based studies. Unfortunately for the reader, this pseudo-scientific framework is a rather thin veneer that detracts from the books’ readability. 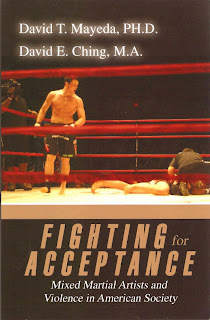 Despite its flaws, Fighting for Acceptance is an important work in the canon of MMA literature. Authors David Mayeda and David Ching are clearly dedicated and intelligent writers who have made an earnest effort to delve into the issues arising from this young sports’ sudden popularity. Without a robust body of research to draw from it is never easy to be among the first to undertake this type of analysis. Their work hopefully marks the early stages of a continued focus on intelligent and thoughtful investigation into the sport. Hey, I've found your blog while surfing on the internet, and i think i could use your help. I'm from Romania, have a BA in Political Science and another one in Sociology, and i'm currently enrolled in a MA in Anthropology. I'm presently focused on MMA, first of all because i've recently discovered it and i really like the sport, and then because i've also started practicing BJJ and here the sport is at its debut, as well as mma, and the development is really interesting to watch. I plan on writing my thesis on mma, but i really lack an academic perspective on it. Do you think we could talk some time? mail, msn, yahoo messenger, whatever? Hey Alex...apologies for the delayed response. I've been out of town for a week or so. I would be happy to speak with you about all things MMA but I can't seem to reach you through your blogger account. Please get in touch with me at jtiefel@austin.rr.com. Thanks for reading!